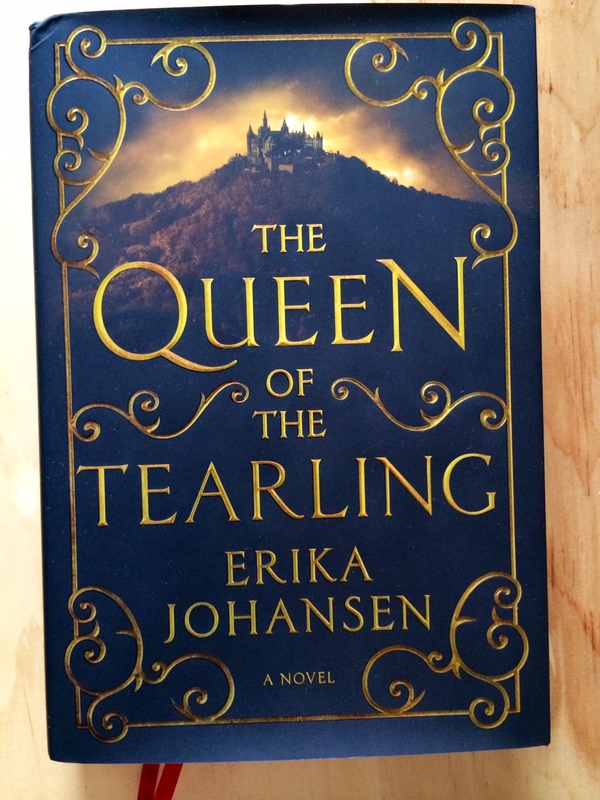 Erika Johansen’s debut novel The Queen of the Tearling* is the subject of a massive marketing and publicity campaign: promotion in major media outlets, publicity at Comic Con, movie rights already sold, the works. The book itself is gorgeous; it even has one of those convenient red ribbon bookmarks built in. It received a starred review in Booklist and a so-so review in Publisher’s Weekly, and yet it’s the July Indie Next pick. If you’re going by Goodreads reviews, though, and let’s say for a moment that we are, The Queen of the Tearling is polarizing, eliciting both rage and raves from its reviewers. So where do I fall? Solidly in the middle, Dear Readers. The Queen of the Tearling has been compared to Harry Potter, Game of Thrones**, and The Hunger Games. It doesn’t match these series by any metric: writing quality, character development, world-building. Nonetheless, it’s a promising enough debut that I’d happily sit down with the next installment (it’s the first in a trilogy, or so I hear). It’s been some hundreds of years since a cataclysmic event caused humans to attempt “The Crossing,” which resulted in new kingdom formation. The Tearling is an utopian experiment gone wrong, a country mired in feudalism where memories of advanced technology (and books) are fading. Its next-door neighbor is Mortmesne (yes, just go ahead and think of it as Mordor), powerful, flesh-hungry, and ruled by an ageless and brutal sorceress called the Red Queen. Kelsea Raleigh, the daughter of the last queen of the Tearling, has just turned nineteen, and intends to come out of hiding and claim her throne. Before she can become Queen of the Tearling, however, she must evade a band of thieves, a society of assassins, the most evil fictional bureaucrat ever, and her uncle (the regent), who’s hell-bent on murdering her before she can set foot in her castle (Or after. Whatever works). Members of the Queen’s guard, led by the fearsome and enigmatic Mace, will do their best to protect Kelsea. And because this is a fantasy novel, we all know that getting the crown isn’t going to be the hardest part of our intrepid heroine’s ordeal. Ms. Johansen has clearly done her reading; she nods explicitly to Tolkien and Rowling, and the epigraphs that precede each chapter are straight out of Dune. (The Mace bears a strong resemblance to Gurney Halleck, too.) The adults-keeping-secrets-from-powerful-adolescents trope harkens back to Ender’s Game. Kelsea (which, sorry, is a name I cannot stand) has some Katniss-like qualities: she says what she means, she’s incredibly intelligent, she cares deeply about those less fortunate and weaker than herself. She’s impulsive and often angry; she’s got depth. On the whole, I liked her. Ms. Johansen’s emphasis on her physical appearance, however, is troubling. Kelsea is repeatedly called, by the narrator, other characters, and herself, plain (with a soupçon of fat-shaming too, oh joy). Being plain in and of itself is not a problem (in fact, please, writers, give us more diverse-looking female characters! ); physically attractive women do not have a monopoly on valor, kindness, loyalty, wisdom, or any other virtue (see: Eyre, Jane; Lewis’s Orual), and it’s refreshing to read a heroine who isn’t take-off-her-glasses-and-she’s-hot faux-plain, just plain-plain. The problem is that Kelsea is dismayed with her appearance, and she thinks about it often enough that it becomes distracting and takes away from the narrative. Also, memo to Emma Watson (who’s apparently attached to the film in the works): Girl, this is not your character. Please let an unknown actress take this one and sweep us off our feet. Ms. Johansen’s writing is solid, but not deftly inventive (Rowling) or stately (Tolkien) or fast-paced (Collins). The novel needs simultaneously more detail and more editing to trim it down. It’s a 434-page book that should be about 350, I think. A couple of plot threads — Kelsea’s eventual love interest, who I presume will become obvious in Book 2, for example — are a bit too easy to tease out, and some feel unnecessarily held back. However, there’s enough material here — enigmas about Kelsea’s parentage, a bunch of Very Bad People, questions about the nature of the event that required The Crossing (pretty sure I have it figured out, but not positive), the fate of the country — to keep a reader entertained. I’d certainly read the next book. A note about the intended audience: Kelsea’s age, the use of magic, and the comparisons to powerhouse series like Harry Potter and The Hunger Games might have you considering picking this one up for your preteen or young teenage nephew or niece. Don’t. The Queen of the Tearling is definitely not YA, and while it doesn’t reach Game of Thrones-level gore, it is violent and disturbing, especially, as I said, with regard to women and children (worse than The Hunger Games, I’d say); it’s an emotionally difficult read in several sections. I’d steer teens younger than 16 or 17 away from this one, or at least suggest you read it first before you put it in front of anyone younger. ** I’ve read two chapters of the first Game of Thrones book, and seen three or four episodes of the show. It’s not for me (at least, it’s not for me until the whole series is published), but I freely admit that the man can write. Thanks for warning me away from giving this one to my daughter. Unfortunately, she will probably come across it herself anyway if it is really becoming as popular as it sounds like it is. Good to have a heads up about it before she mentions it! Good review! I’m with Ariel and WhatMeRead — enough dsytopias already! Unfortunately, one of my daughters has already read this, but the youngest one certainly won’t, thanks to this excellent (and funny) review. I don’t know if I would read this book, but I certainly found your review amusing! I personally am getting burned out on dystopian novels, too, although I HAVE to finish Maddaddam! I agree. I could give dystopia a break, but for Margaret Atwood, I’d read ten of them. I’m glad you thought the review was funny! I am torn about this book even after reading your review. It seems there will be things I like about it (dystopian future) and things I will dislike intensely (emphasis on looks, mirror of so many other books). I’ve been reading such varied reviews, but it really does seem like it can swing either way depending on personal preferences. I enjoyed your review and references to so many other similar works. Did you enjoy Dune by chance? I may embark on that adventure (all 900 pages) soon. Oh my god, I LOVE Dune. It’s so great that I won’t read the sequels, because I don’t want anything to take away from how much I love it. And it’s not quite 900 pages . . . Rick and I were supposed to do a read-along this summer for it, but I don’t know if that’s still happening. Also, of QotT: the first chapter is pretty representative of the book as a whole, so if you found it in the bookstore or library and read a few pages, you’d probably be able to tell if it would be worth the time to read the whole book. I just finished reading Tearling and was amazed to have liked it as much as I did. I agree with much of your assessment here, especially about distractions regarding looks, love interest, and the fact that this book seems to have been cobbled out of many works. Yet, I still found it highly entertaining and would read the next one. Next up: Dune! Dune!!!! Man, that’s one of those books I wish I could read again for the first time. I love Dune. I kind of want to get it off the shelf right now . . . Can’t wait to hear what you think! Great review – and good job remaining neutral while still being honest. I was also torn about this book. I was intrigued enough to keep reading it once I started, but the writing and world-building had too many faults to keep me fully immersed. Every once in a while I had to stop and roll my eyes at the stereotypical characters at court, or to scratch my head at the underdeveloped background information. You make a good point about younger teenagers maybe gravitating towards it because of all the [over]hype and comparisons. I may have enjoyed QoTT when I was in high school, but definitely not before! Just popping in to say how happy I was to see your reference to Orual. Till We Have Faces is one of my favorites, but it doesn’t seem to be very well known.